Recipe Credit: Chef Leticia Schwartz. Photo Credit: Chef Leticia Schwartz. 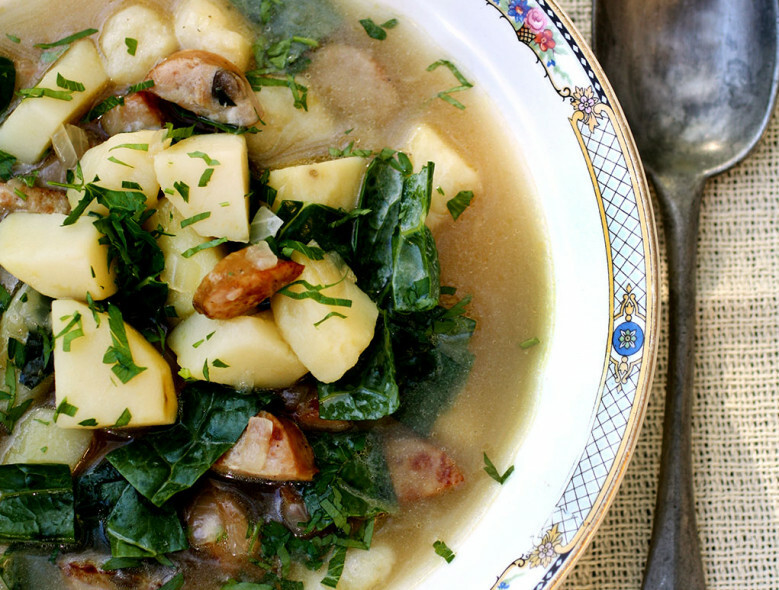 This classic Portuguese Soup is satisfying in every way. Traditionally, the soup is done with water, but chicken stock adds greater depth of flavor in this recipe. Chicken sausage instead of the traditional chorizo makes for a more diabetes-friendly dish. The kale adds a vibrant green color that gives Caldo Verde it's name. Feel free to play with different types of greens like collard greens or spinach. *Look for fully cooked chicken sausage (your choice of flavor) with <500 mg sodium per 3 oz link. Heat 2 tablespoons of olive oil in a large soup pot, add the sausage and cook until it’s lightly golden all over, about 5 minutes. Using a slotted spoon, remove the sausage from the pan, transfer to a bowl and cover with aluminum foil to keep warm. Meanwhile, add the remaining 1 tablespoon olive oil to the pan. Add the garlic and cook until it just starts to turn golden, about 2 minutes. Add the onions and cook, stirring frequently, until it’s soft and translucent, about 4 minutes. Then add the potatoes and mix well, allowing them to get hot, stirring occasionally with a wooden spoon, about 4 minutes. Add the cooked sausage back to the pot along with the chicken stock. Cover the pot and bring the soup to a boil, then lower the heat and simmer gently until the potatoes are just cooked and fork-tender, about 15 minutes. Add the greens and cook at a gentle simmer until the kale is bright green and wilted, about 5 minutes. If you want to prepare the soup ahead of time, hold the kale and add just 5 minutes before serving. Season with salt, black pepper, and a pinch of cayenne pepper for heat.